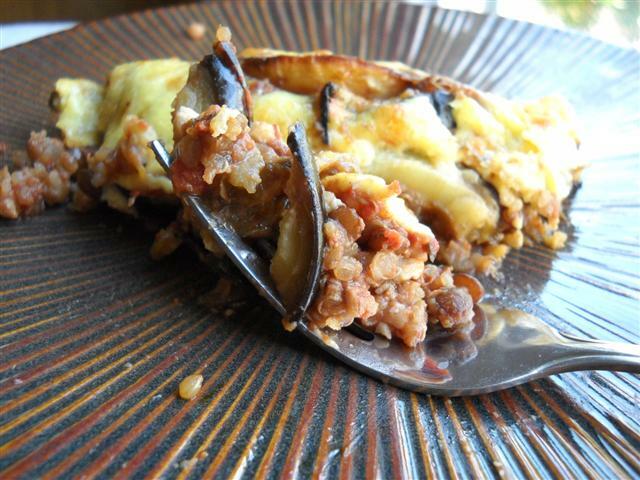 I still remember the moussaka I had in a restaurant once a few years ago. It was heavy, rich, but delicious! Simply potatoes and eggplant and tomato sauce with cream on top, but somehow it seemed so much more than that. I’ve been wanting to replicate it (though less oily version) ever since. , but thats always me! This does take about 2 hours to make, so by no means a quick dinner, but worth it once in a while. First, I soaked 1/4c quinoa and 1/4c french lentils separately. Then I brought 1c of milk to boil with 4 peppercorns and 1 bay leaf. As soon as it boils remove from the heat, and cover, and keep aside. French lentils... see the pretty pattern? 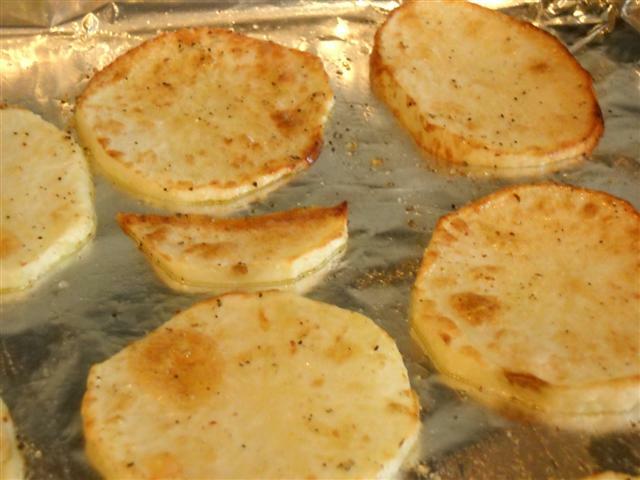 Slice 1 large eggplant in 1/4 -1/2 inch slices and place on a baking sheet. Liberally coat with olive oil on both sides with a brush or fingers. Eggplant loves olive oil! Broil in the oven 5 minutes per side (flip over after first five minutes). 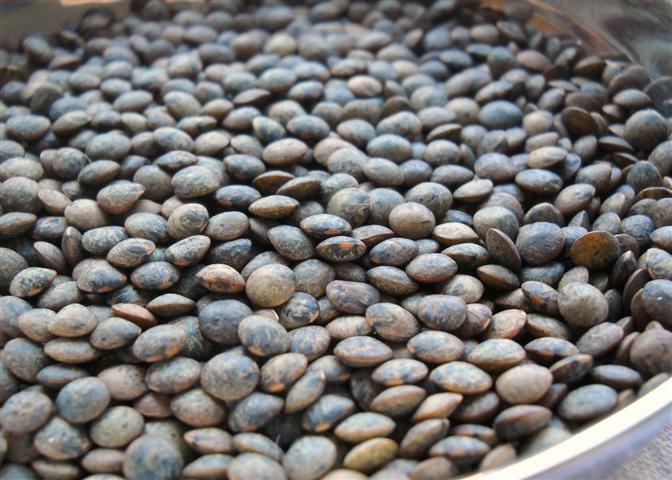 **After cooking the lentils for 20 minutes, check to see that they are nearly cooked but not completely. 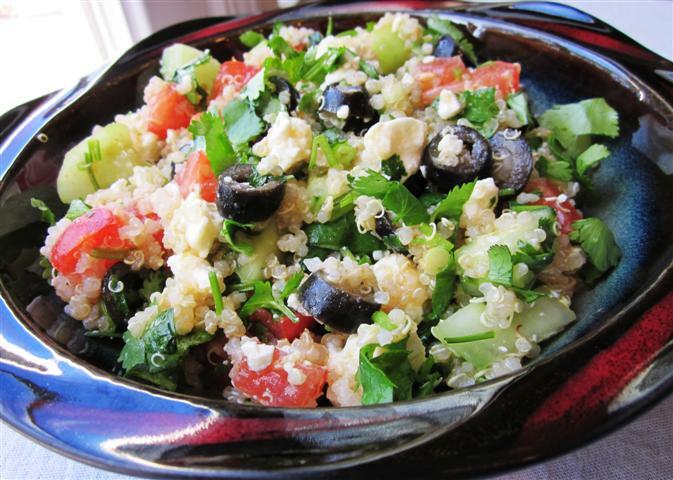 Now, add the drained quinoa to this along with dried Greek herbs. Cover and cook another 20 minutes. 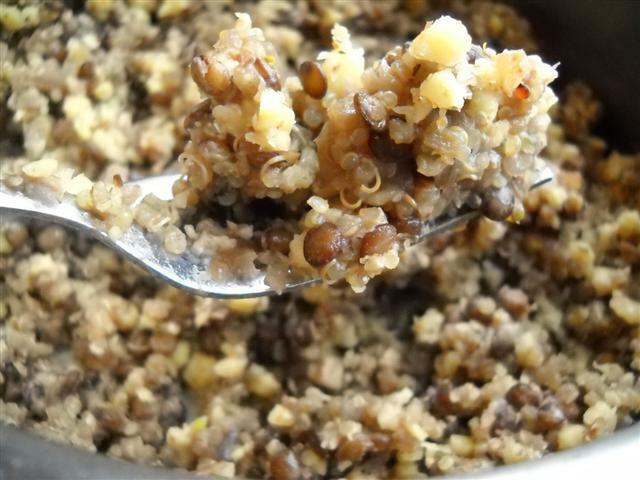 Once quinoa and lentils are cooked, and all liquid is absorbed, mix with walnuts, tomato puree, salt, chili powder, 1/4tsp allspice, black pepper. Coat baking dish with olive oil. 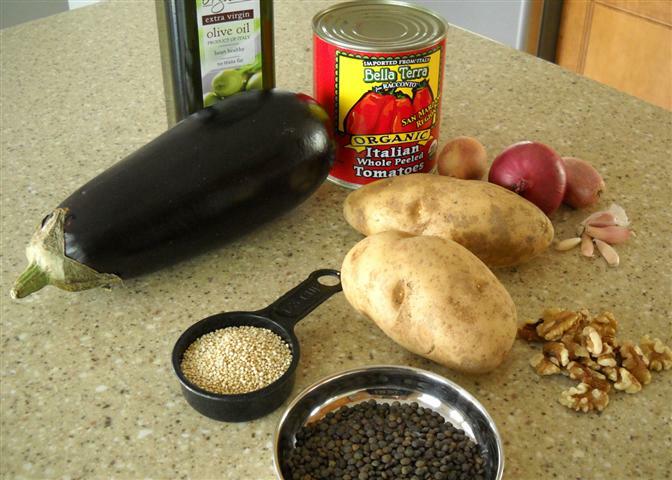 You can use 9×13 for thinner version or 8×8 for thicker one.Layer the eggplant then potato, then quinoa mixture. Repeat. Pop in the oven while you make the bechamel sauce for about 10 minutes. Grate 1/4c parmesan or kefalotyri(Greek) cheese. You don’t need much at all, you can also skip this. 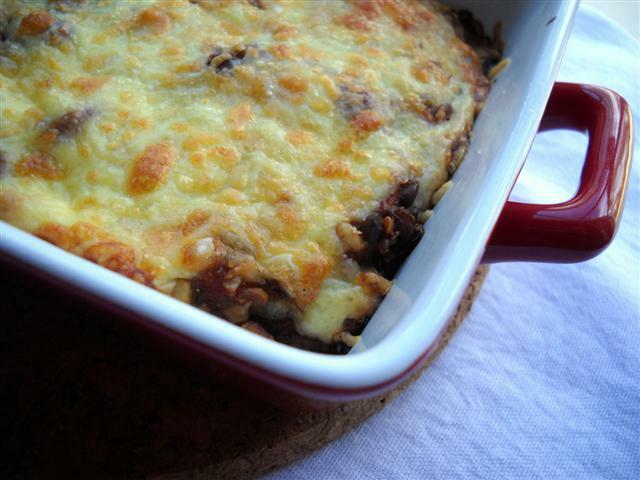 Take the baking dish out of the oven and pour oven the bechamel sauce. Sprinkle lightly with the cheese. Put it back in the oven for 25-30 minutes or until lightly browned. 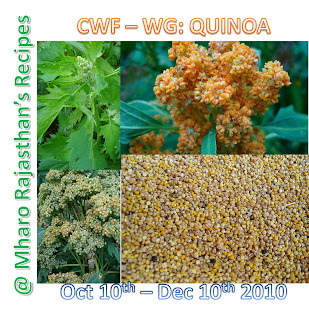 This is my entry to CWF- Quinoa hosted by Priya at Rajasthan Recipes and Kiran. And also to Vegetarian Foodie Fridays.